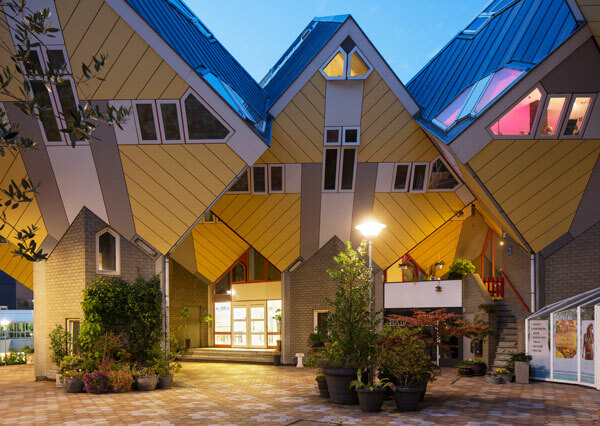 Tilted walls as standard: According to plans by the Duch architect and major representive of the structuralism Piet Blom, the "Supercubes" – also named "tree house settlement" – were built in Rotterdam in the 1980s. 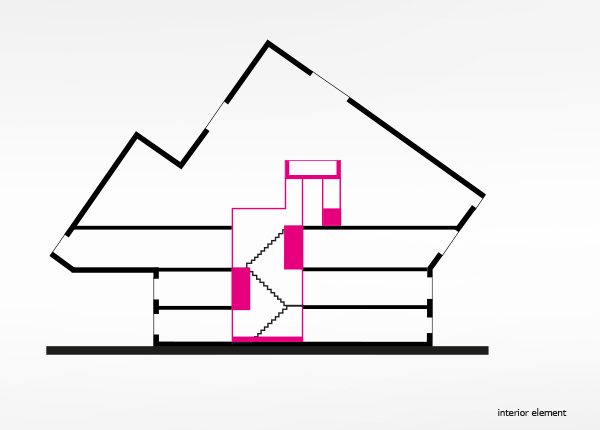 The section shows, the new central element (in pink color), that creates vertical relationships within a cube. It was “not an urban planning project but a way of thinking, of imagining, a new view of things and of life,” – this is how the Dutch painter and sculptor Constant (1920 to 2005) explained “New Babylon”, the model of the utopian city he created between 1956 and 1974. Constant intended New Babylon as “a kind of pattern for society of which constant change and transformation are integral parts.” His utopia, which may just as well be a dystopia, called for a city without fixed borders, which offered its inhabitants a flexible, open but nevertheless networked living environment, a city that thanks to its permeable nature would prompt its people to forge their own links between different locations – long before the notion of “participatory process” found its way into the urban planning briefs. The notion of the forever changing city that is primarily defined by relationships also happens to be the defining key trope of Structuralism, an architectural movement based on the idea that the elements used to form structures are mutable, whereas the relationships that arise within these structures are not. In practical terms this means that basic geometric shapes are multiplied and establish structural relationships to produce a whole. Consequently, Structuralism tends to take the form of serial architecture, in other words repeating serial elements that combine to form a whole. Piet Blom, alongside Aldo van Eyck and Herman Hertzberger, is one of the Netherlands’ main protagonists of Structuralism in architecture. True to its doctrine, Blom designed his “tree house complex”, which was built in Rotterdam between 1982 and 1984, as a structure for a small footprint that was broken down into various building elements in a bid to spare its inhabitants a lonely and alienated urban existence. Now the “Supercube”, one of the buildings in the estate that has recently been refurbished in line with plans drawn up by Rotterdam-based firm Personal Architecture, aids further social integration: It serves as a residential facility for 20 delinquents in the final stage of their detention. Notably, Piet Blom himself already envisaged three large cubes which he intended as the estate’s social hubs. Back in 2009, the designers at Amsterdam design studio Edward van Vliet teamed up with architects Kees van Lamoen and Maarten Polkamp and Sander van Schaik from Personal Architecture, and together they revamped two of the cubes, which had been vacant for some time, and transformed them into a hostel for the Stayokay group. Now the third cube has been given a makeover. Or rather we should say “continued” or “fully completed”, for its interior always remained unfinished. 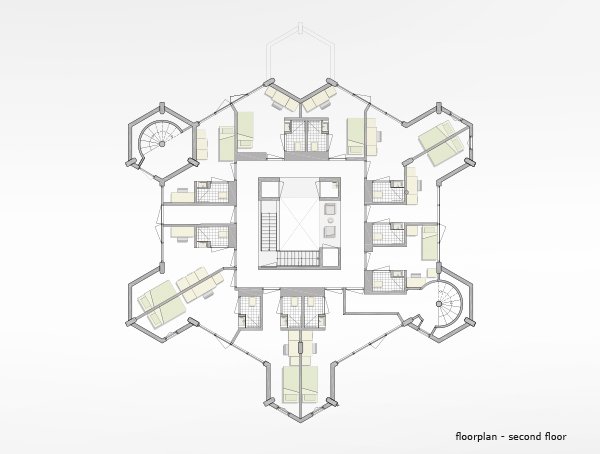 The original division of floors as foreseen by Blom struck the architects as being rather oppressive, cramped and dark. Plus they felt that there was little coherence between the different floors. So they replaced the horizontal distinctions that Blom inserted between the floors with a rectangular shaft that introduces vertical relations into the building interior. However, what the architects perceived at first glance as a shortcoming in the building’s anatomy transpired in the course of the design process to be a major opportunity. 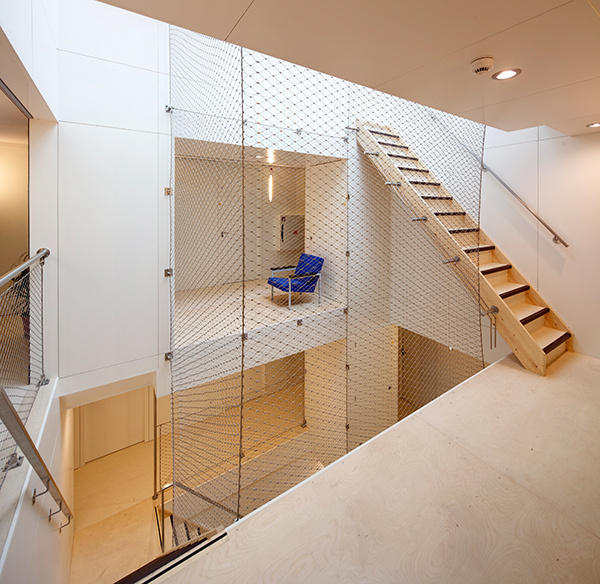 For it meant that Personal Architecture was able to reconstruct the floorplans, zone the different levels, and remove the vertical division between the floors. 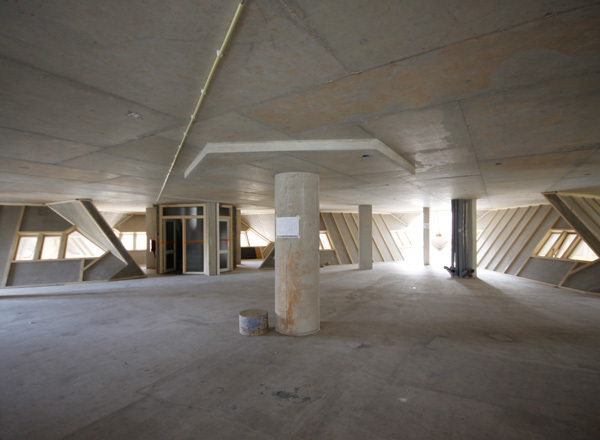 The reception, a laundry, bathrooms and a storeroom are tucked into the walls surrounding the central void. On the top floor the “house-within-a-house” accommodates the kitchen of the residential facility, and on its “roof” Personal Architecture’s structural intervention lets you experience why the estate has been nicknamed “tree house complex” or “cuboid wood”: Taken together, the geometrical structures form a neat architectural landscape. As if perched in a treetop you can cast your gaze over the other cubes’ roofs and the entire city. 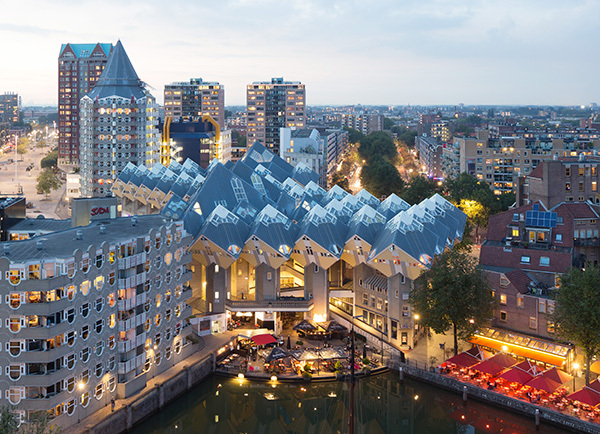 Following modernization, Piet Blom’s cuboid wood is a clear demonstration that Structuralism intends its buildings to serve not only a functional, but definitely also social context. 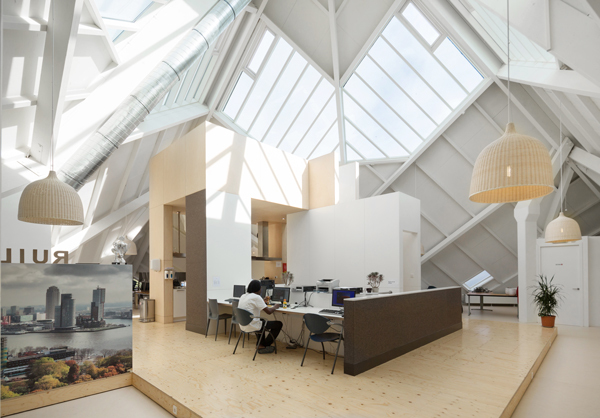 The completion of the “Supercube” and its new use as a home to former delinquents has made the cube complex an integral part of the urban society – functionally as well as socially. And who knows, in the future perhaps we won’t even need a New Babylon to inspire the people of a city to become involved in forging new relationships between its inhabitants and places?